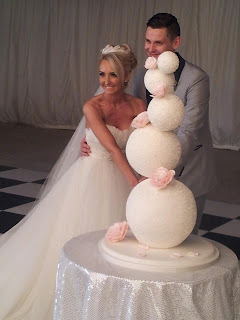 Love this photograph of Alana and Mark, with their five sphere Wedding Cake at their recent Wedding at Mar Hall, not to mention Mom's thank you! Hiya everyone at Rainbow Sugarcraft that made this wonderful stunning cake it took everyone's breath away !!!! and of course tasted magnificent, and thank you for the cutting cake also, I will certainly be singing your praises to everyone, and I will be back for more I might even make up an event just to get to eat the cake lol. Thank you once again for all your hard work its been an absolute pleasure to deal with yourselves.